J Day is an international celebration of cannabis culture and protest against pot prohibition. It’s the original “protestival”, now in our 25th year! presented by Auckland NORML, The Hempstore and Jafa Mafia, featuring stalls, music, djs, info booths and more. Music from Jafa Mafia, The Triptonites, Exile and Biggi, Sgt. Benji, Cyrus, Ray Guevara, Cam Tokington, and Jah Merriman! Everywhere else – wherever you are, stop drop and roll at High Noon or 4:20! All J Day events are free, and run from High Noon to 4:20pm (approx). 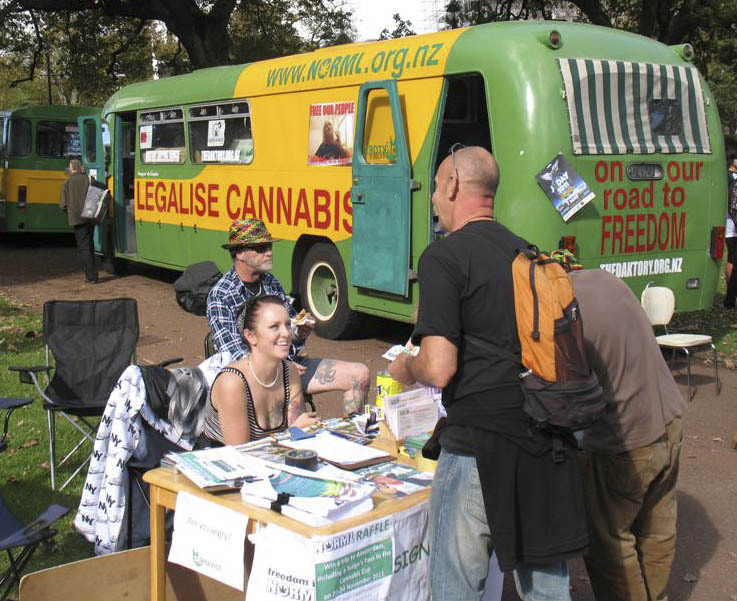 NORML stall at Auckland J Day. Bring your buddies. J Day is R18. Bring a sign, flag or banner. Make a donation to help cover our costs. We are looking for more local organisers and helpers. If your town or city is not listed above, how about getting involved and helping make it happen? Musicians, speakers and stalls also wanted – please contact us.